I would have been satisfied with cereal for breakfast, but Jon had other plans. He offered to make me an omelet and disappeared into the kitchen. 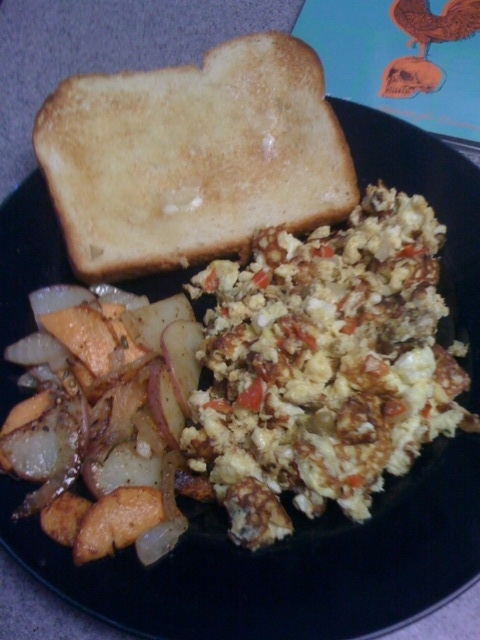 When he emerged, he held a plate overflowing with yummy goodness: fried potatoes, scrambled eggs and toast. Of course, these weren’t just any ol’ fried potatoes, scrambled eggs and toast. Jon added his “twist” to them and the result was pure perfection. And the best part is, he made everything from stuff we had leftover in the refrigerator, hence the title of this post- His Version of Garbage. Served with Brownberry’s Country Buttermilk Bread, toasted. And in the background, Jon made sure to capture our friend Clint Roth’s new CD– Appetite for Construction. Clint is amazingly talented and we’ve enjoyed listening to this.